Review: King of the Dice and dice for the king! Unicorns are animals that all of us always see as peaceful, cuddly and soft. But it can only be said by someone who has never met a real unicorn. In fact, they are temperamental and petrifying monsters, just enough to attack you. And because they have a big pointed horn on their heads, angry unicorns are dangerous! 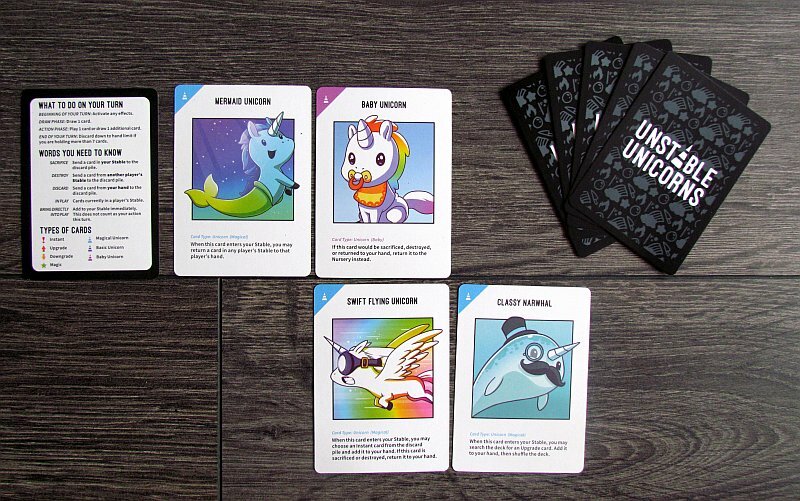 And it’s about these fairy-tale creatures and their fighting abilities, that new Unstable Unicorns card game will tell us more. It was created by Ramy Badie and box was shielded by TeeTurtle, who otherwise makes cute T-shirts. But who would not like unicorns? So, their spell was cast on 33,000 players on the Kickstarter server. Game was released in 2018 and Esdevium Games took over the distribution. It all starts with a small box, exactly as white as a unicorn fur. On the sides we find signs that there might really be some cute buddies inside. And there really is more than a hundred cards (exactly 135), which for the most part contain some form of unicorns. They are usually a little different, than you know from tales. 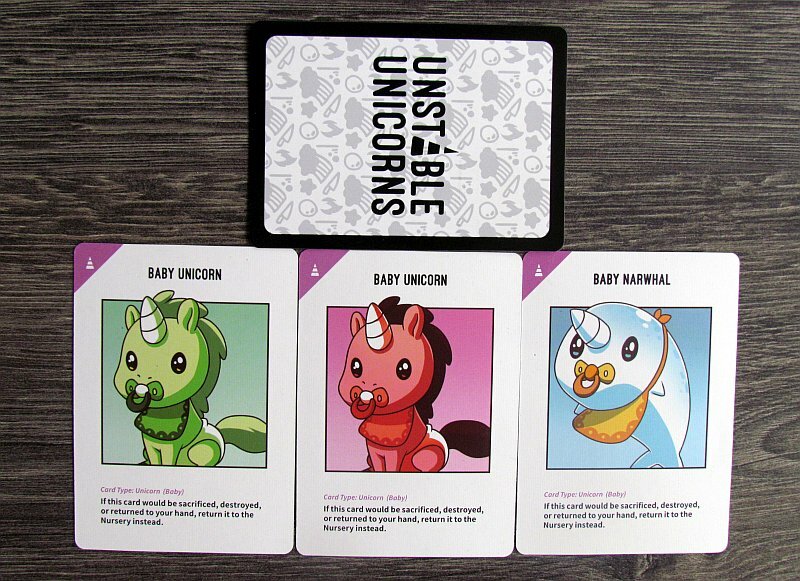 Always before the game, a set of baby unicorns needs to be sorted out of shuffled cards and one is given to every player. 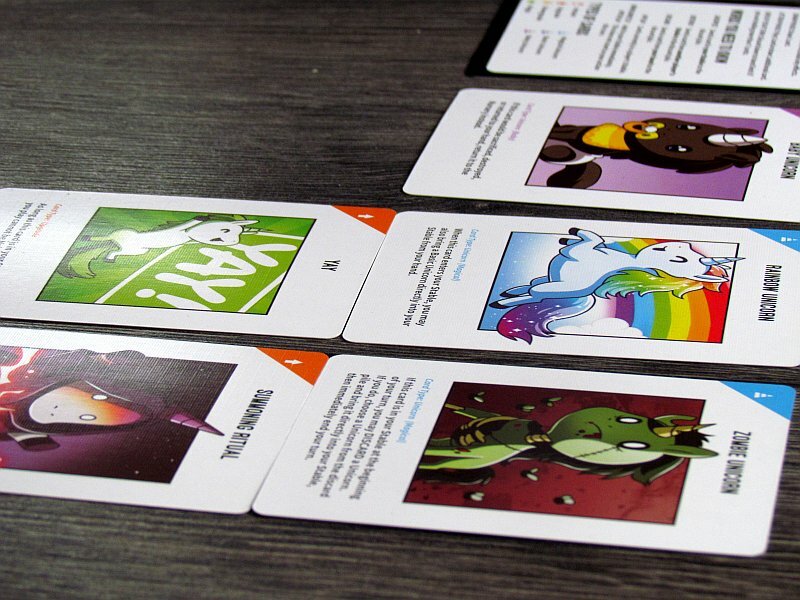 The rest must be shuffled together and five cards are handed out to each player. 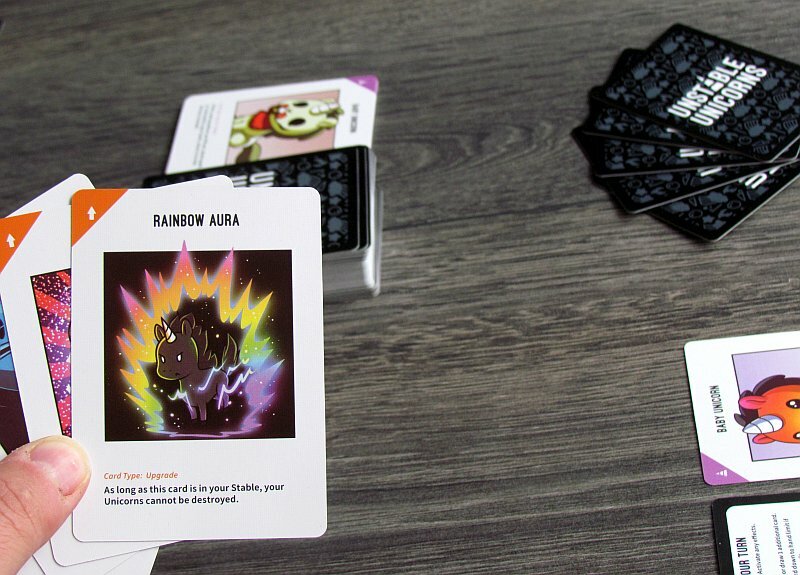 Players alternate in round and each such attempt to win starts with drawing a new card from the deck. As a second step in his turn, player can either take one more card or use his current hand options and play one card according to its rules. There are seven types of cards in the game – three levels of unicorns, then upgrades, downgrades, magic and reactions. Every kind with its simple rules of play. 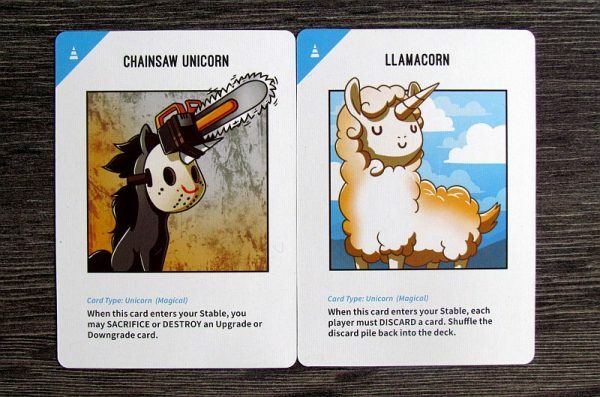 Usually, players will play new unicorns into their stable, support them with improvements and attack the opponent. The biggest chaos, however, is caused by spells, that have the ability to completely shake whole state of the game. They can cause unicorn’s death, card exchange and other effects. They are powerful weapons, if they are played in the right moment and on the right opponent. 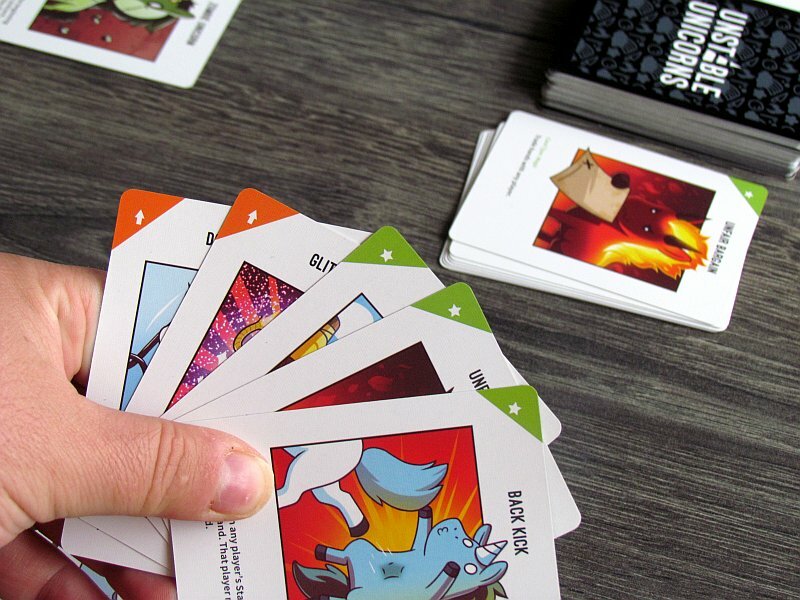 At the end of the round, player may never hold more than seven cards. Any excess must be discarded. 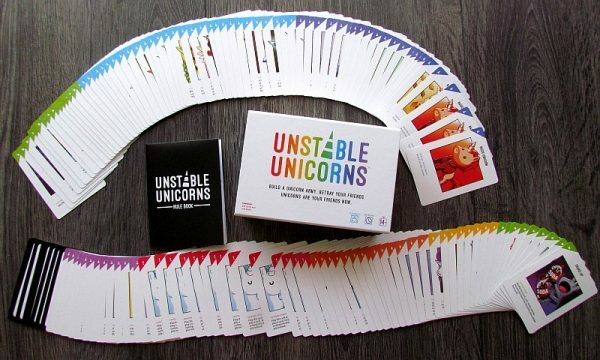 The aim of all is to create the largest army of unicorns. 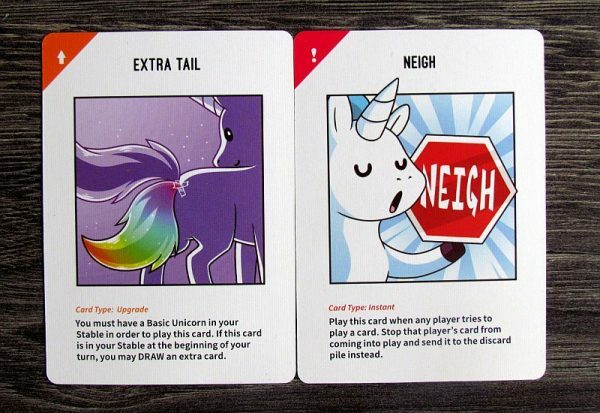 The size is clearly given, so it is usually enough to have seven unicorns in the stable for the player to immediately celebrate the victory. And that’s all. 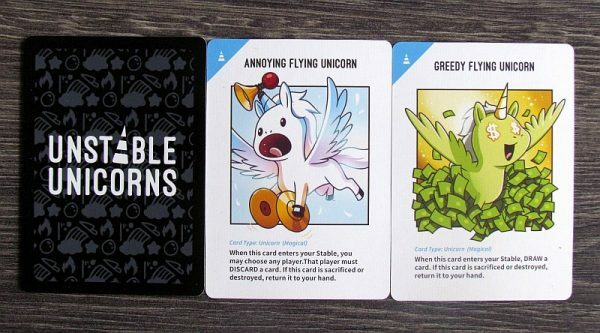 Unstable Unicorns is really funny, but definitely not a complicated game. 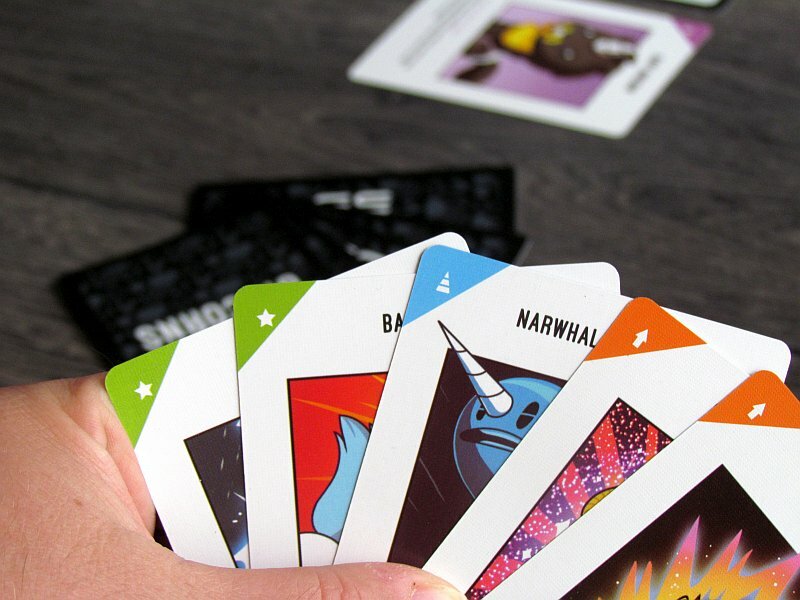 On the contrary, especially fans of Fluxx should be interesting in this game and also of similar crazy games such as Exploding Kittens. 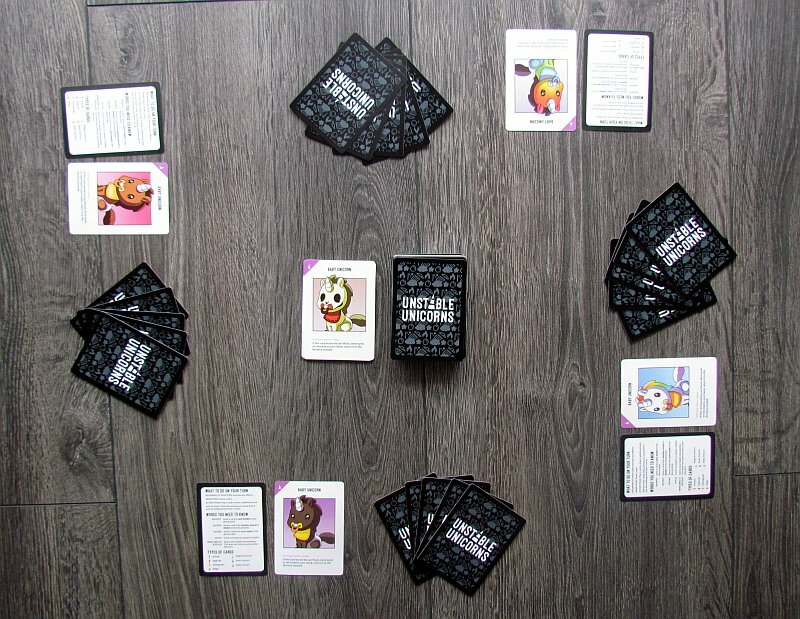 The game is lightened on one side and the players are not bound by complicated rules. At the same time, it is also crazy and you never know what may happen next. Players carefully protect their cards and try for timely play. But everything depends on luck, because the cards are shuffled and so it may happen, that unicorns do not arrive on time in your hand. Fortunately, there are other ways to get them and those players already have control of. But again, he must hold the right card in his hand to do so, so the circle closes. Due to the simplicity of rules and progress, it is generally expected that matches should be fast. But it is true only in part. Individual battles take place in space for some thirty minutes. Once the players know all the cards in the deck, game time does not have to stay inside half an hour, and thanks to the ability to get rid of the opponent of almost all unicorns, it can even double. 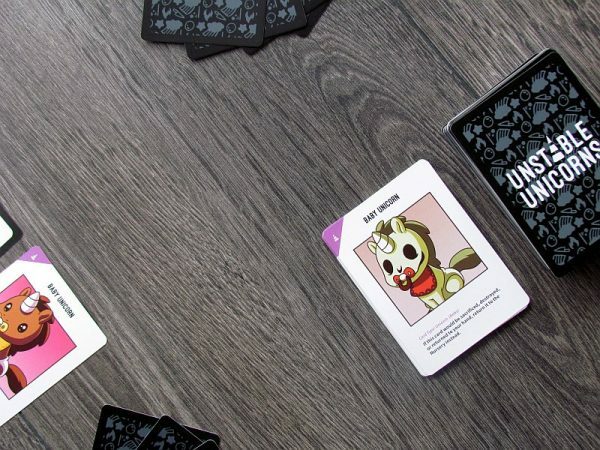 Fortunately, in the rules there is a variant that talks about the end of the game after finishing the whole drawing deck. But at that moment no one will win! The whole process is full of dragging and it’s not enough to just get seven unicorns and play them. 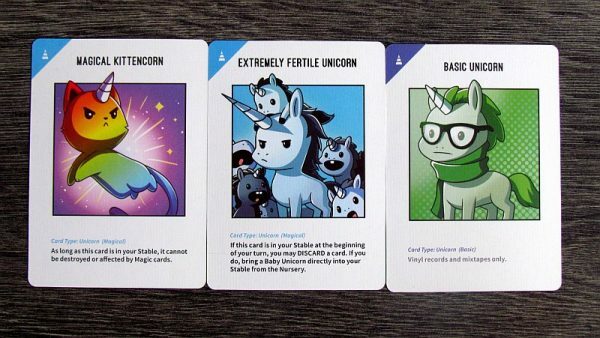 On the contrary, you lose some of already gathered unicorns, so the game is constantly evolving and pouring. And that’s why it’s fun. 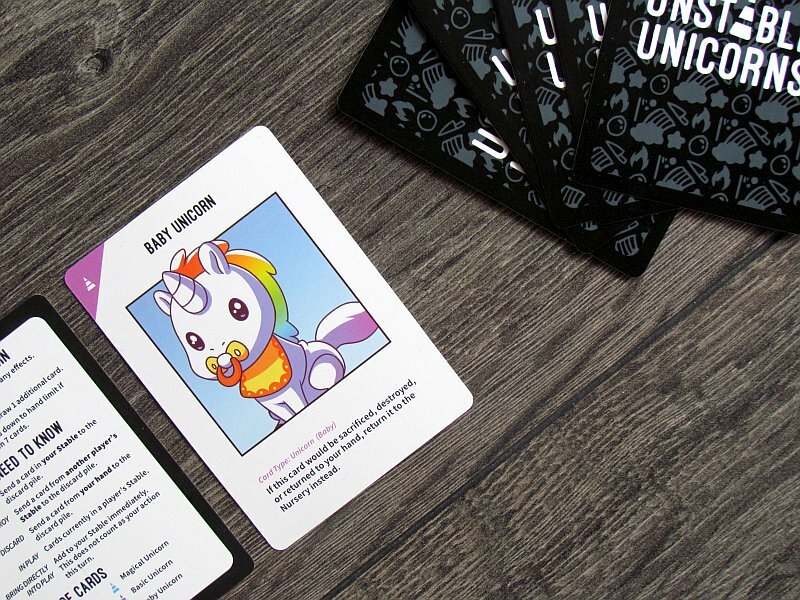 Players do not usually give anything for free in this type of game, so it’s obvious, that you will not be playing Unstable Unicorns in two. And that’s right. For the best experience you need at least three and preferably four participants. Just be careful not to bring too many players to the table. Although the box allows up to eight rivals, in the highest numbers you will be waiting for the move instead of playing. But the best of this game are the illustrations and (of course) its theme. Pictures are often cute, sometimes humorous. It’s jokes, that’s what the game relies on most. 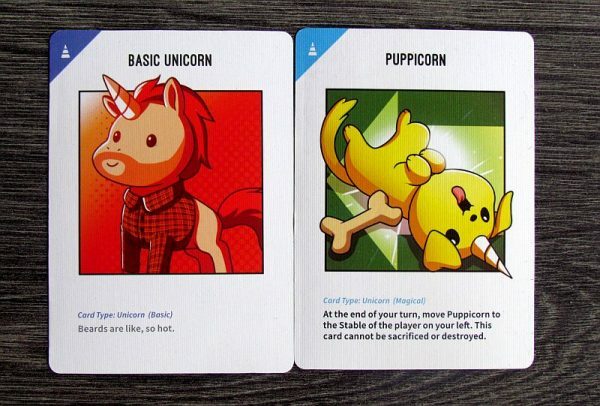 And so among the cards you will find Puppicorn, a Zombie unicorn and you will learn how such a unicorn phoenix would look like. The cards are of good quality and are expected to be often shuffled and held in hand. 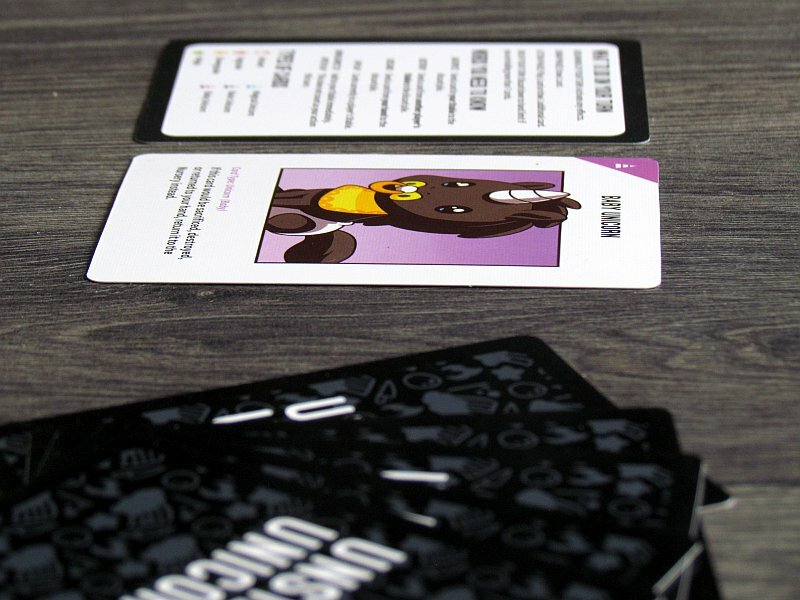 Cards have a fairly small font, which can spoild game for players with bad eyesight. 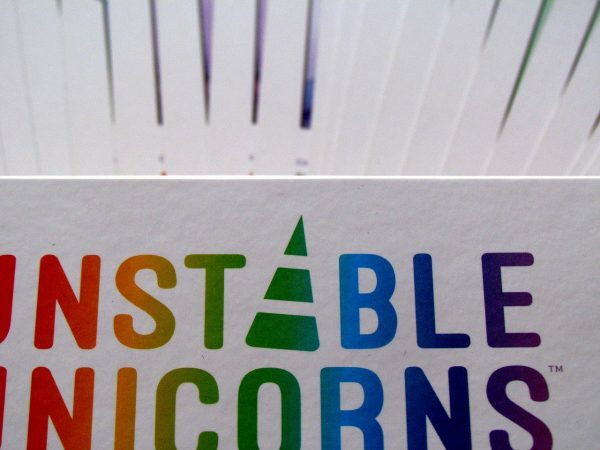 Unstable Unicorns walk in cute kittens patch. Even unicorns will be first about processing, which, fortunately, is not everything. The game is a very nice filler even with its gameplay, but it tends to stretch too long before you get a winner. But if you do not mind this catch, then you will be happy to include Unstable Unicorns in your game room. Unstable Unicorns is a game, that will appeal to everyone. Unicorns are simply creatures made for cuddling and playing. Everybody likes them. And the same thing could be said about this game, which is simple and fun. But there is one important catch: the game can drag for too long thanks to the strong abilities of cards. It's simply not easy to gather seven unicorns in stable without somebody drawing them out. 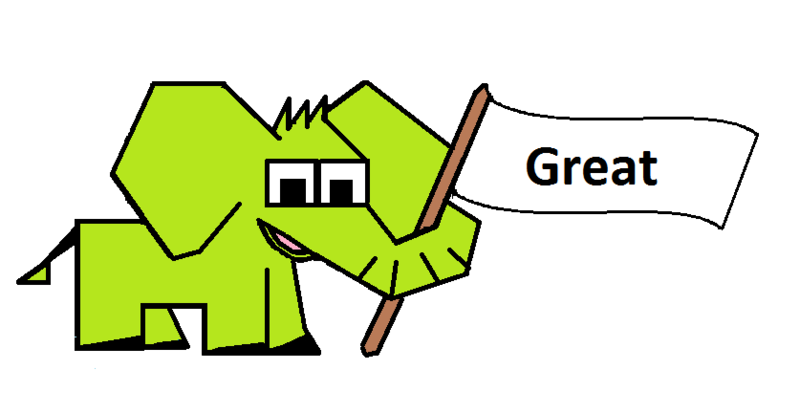 Everything else is super fur and everything is dominated by beautiful and funny graphics. 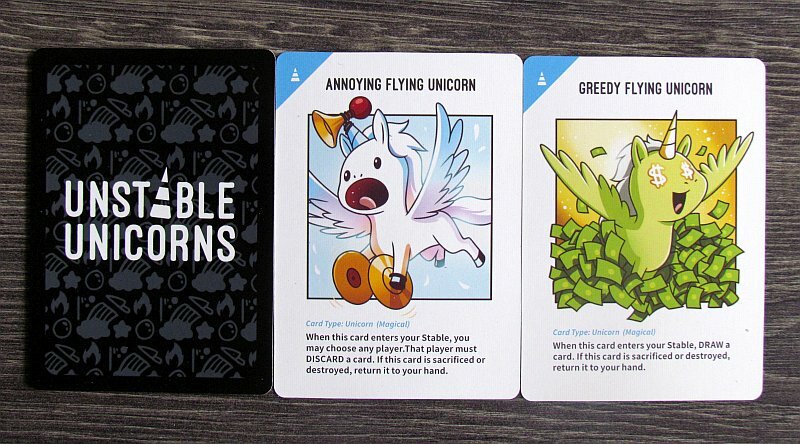 Unstable Unicorns is just as fun and entertaining as they should be.